At the end of 2009, I acquired six Pekin ducks (three boys and three girls) with the intention of serving crispy five-spice roast duck for Christmas dinner that year. But they were so darn cute that I immediately fell in love with them and couldn’t let a carving knife anywhere near them. Last spring, they started laying eggs. We’d come home to find a duck egg sitting in the middle of the driveway, or in a flower bed, or under a fruit tree. Then the dog started eating the eggs as fast as they could lay them, so the ducks scarpered to the neighbour’s lifestyle block and parked themselves up on their lawn. We didn’t see them again for three months. 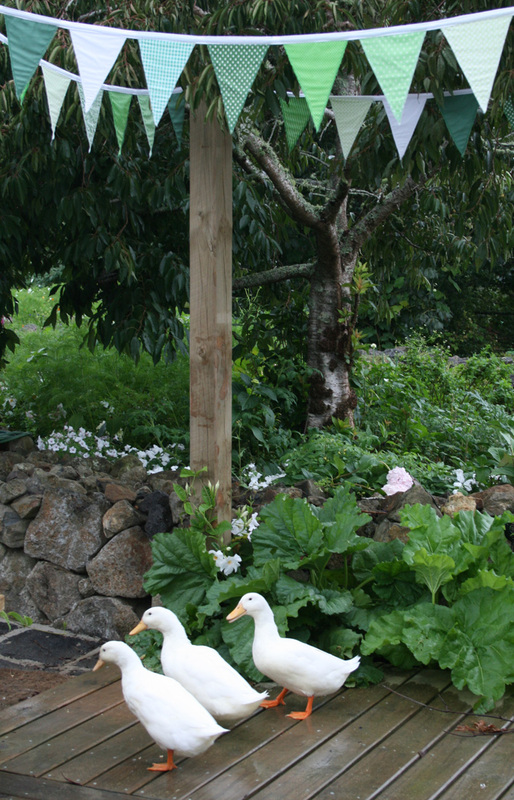 Having started with six ducks, by January, when they returned home, we were down to three. (The boys have abandoned their womenfolk; only the girls remain.) Every day they waddle up through the paddock from the swamp to wait patiently by the chicken run (I chuck them a few handfuls of grain while I’m feeding the chooks). If they’re not there, I only have to yell “quackers” from the house and they come running. I think Pekin ducks are the most adorable birds. They’re such gossips – all day they yabber away to each other – and they’re best of mates. They’re also kitted out in such lovely white feathers that it seems a shame not to include them in the wedding ceremony somehow. So, for the past week, I’ve been bird whispering… luring them slowly away from the chicken run to hang out on the lawn, where they can look cute in our photos. And – success! – this morning when I got up, they were already waiting for me under the floral bunting (Mum has sewed several hundred metres of these gorgeous green and white flags for me, bless her) on the deck outside our front door. months ago you made the remark that you use “stockholk tar” to keep opsums away, we are so greatful for that information and as we are a little bit older than you more than a little I must be truthful we have an acrea, we are now reaping organic blueberries apples etc. and plenty of veg besides haveing plenty of fun, we have a great number of animals 2 sheep 3 cats our mate the retriever died last October keep up the good work. Bunting – bless your mother. I have a love affair with the stuff. It immediately makes a place festive and fun. I have fantasies of buying a sewing machine and making my own, but it will not happen! Can’t wait to see more photos. Hope you’re having a great time still with the planning and prep. And taking some time to rest too. Hi Shelley, I also *adore* bunting. I’ve loved it since my very first trip to England when I was in my early 20s. I stayed in a little town called Buckfastleigh as I was visiting some wwoofers who had stayed with my aunt and uncle in Pukekohe. The whole town was rigged up with bunting when I was there. Just gorgeous. And I’m right there with you on the sewing machine. Should really have asked for one as a wedding gift. I can’t sew to save my life but, man would I like to! Your ducks look gorgeous in that pic, as does your mums bunting. Wishing you and your future hubby all the best for your special day next week. Thanks Janine. Mum has done a marvellous job on the bunting. I’m itching to stick it all up already but I don’t want the fabric to fade in the sun before next Saturday! You do realize that domestic ducks are defenseless creatures that can’t fly and require protection from predators… those drakes were more likely killed thanks to your neglect and negligence. You should have cooked them yourself and saved them the pain and suffering of being eaten alive. Shame on you. I think you may have misunderstood my blog post. The ducks haven’t been eaten alive. They just moved next door. And if you think they are defenceless and can’t fly… well I don’t know what you’d make of the sight of them flying across our swamp each day.